Did you know you can now order your Deliveroo takeaway from Jamies Italian here on View? 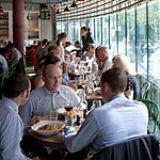 Situated within Canary Wharf, Jamies Italian gives diners the opportunity to experience Jamie Oliver's take on rustic Italian dishes at affordable prices within informal surroundings. What did you think of Jamies Italian? 2 stars is really being kind to this place....go burger king ...honestly. what a disappointed meal i had... food (scallops & squid ink pasta and black truffle risotto) wasn't good... and even the tiramisu, which i thought it wouldn't go wrong that's why i gave it a try regardless how much disappointment i had on the starters and mains, but it wasn't good neither... waiting time was really long given it wasn't that full at the time, though the staff there were quite nice. Although it has been a while since I went to Jamie's I thought it was great, good food, good atmosphere, good service. You can spell linguine/i both ways. Check your facts before you set out to ridicule someone - otherwise you look ridiculous yourself. All speak well of this place, but I was greatly disappointed! Maybe I chose the wrong dish. I spend more than £15 for Fritto misto (Crispy fried fresh seafood) but it was not fritto misto because there were only fried sardines, seven to be exact! Fortunately, the appetizers were good, but I can not say the same about wine, I think it was low quality. 2 stars, it would have been 1 star if not for the amazing staff. It has to be said- everything about Jamie's Italian is ok, apart from the food. We went on the weekend with 4 friends of mine. Although we had to wait 40 minutes to be seated, it wasn't that bad experience. The decor is all right, nothing more nothing less, kind of canteen-looking. The waiter not only good looking but also funny and charming. Starters delicious, but the mains. We had 3 pastas and a steak. The steak was tasty but the pastas. A disaster. 2 bolognese: many bolognese from the jar taste better and I'm not exaggerating, and 2 carbonara: disastrous combination of oil, cream and meat scratchings. My sister does better carbonara! No no no no, will not be coming back. Which is a shame on account of a good overall set-up. lovely restaurant! the staff are so friendly, the food was delicious. So fresh and tasty. lovely views out to the river. would definitely come again. quirky toilets with funky mirrors! and to top it off our waiter was hot! Fantastic restaurant. The place has a very nice atmosphere. Service is great and much better than most of the restaurants in the canary wharf area. The restaurant is family friendly and has high quality highchairs for families with babies or toddlers. Went for lunch last week. Main dishes are nothing to write home about, but the bread basket and olive oil is tasty. Prices weren't too bad either. went to jamies Italian for a Saturady evening meal with friends. The experience started with a 1hr 10min wait to be seated. and for the 1hr 10mins wait we were crushed with 40 other people waiting to be seated. i thought that it must be popular, but after waiting at our table for 40mins before our starter arrived and 45 mins after finishing starters for our mains to arrive. i realized the queue was due to the lack of speed of producing such simple meals (all our 4 starters required no heating, cheese,basil and pate, and still 35mins preparation) the food was very plain and could have produced the same at home in a fraction of the time, and better. Will not be returning. A real let down jamie. I believe our friend Jamie has to try it again - sorry but this one is not good at all. Very good atmosphere and a good looking and with very appropriate manners waitress. But the good notes finish here. the items on the menu have not much in common with italian cuisine (even the names are either wrong or misspelled)-I had a linguini (ie: FYI correct spelling is linguine) pasta with shrimp: it was pasta (salt was forgotten by the chef....) with some shrimps (4-5 no more I swear) like just out of the freezer and microwaved , some tomato and same veg (non clear which one) scattered on top. When I finished the pasta, there was a pond of watery tomato left at the bottom. I went to this "italian" restaurant to treat myself (being italian) I was very disappointed by the quality of food. All the dishes we tried (we were 14 of us) were tasteless, bland and boring. We suspect that most of the ingredients were frozen not fresh!!! Worst experience of italian food in London ever. This site won't let me reduce the star rating, if it would I wouldn't give any.I can' believe we were ripped off by Jamie Oliver this evening. We spent £76 on two starters, one bread basket ,two bowls of pasta a few soft drinks, a few bits of shreded veg in a small ramkin dish (which was called a side salad). But without a doubt it was my main course which really took the biscuit, one lamb chop cut to three slices ( @ £13.95), on it's own without any sides. Don't waste your time by going, I blame Canary Wharf management for heavily advertising the place everywhere, how much do they get out of this ? Following ventures in Oxford, Bath, Kingston and Brighton, the fifth Jamies Italian has opened in Canary Wharf. The ever-busy Jamie Oliver’s chain of Italian restaurants is quickly taking over the UK, with four ventures already opened across the country – including one in the London suburb of Kingston – and several more on the cards. The latest addition to the capital is a new Canary Wharf location nestled into Churchill Place. Non-Canary Wharfers usually confused by the maze of streets, canals and overwhelming skyscrapers will be glad to know it’s only a few minutes’ walk from Canary Wharf tube. Like the other locations, the look here is fresh and vibrant, with bright colours, interesting furniture (including painted metal chairs) and the occasional graffiti – for decorative purposes only, mind. The designers have valiantly tried to make the restaurant feel warm and friendly with wooden boxes of fruit and veg, large tree stumps acting as bar tables and old fashioned stations where staff cut bread and make up antipasti platters. Unfortunately though, you can’t take the corporate out of Canary Wharf. Floor to ceiling windows overlook a busy road on one side and Churchill Place’s Starbucks kiosk on the other. The outside seating, whilst nicely located on the canal, is a bit sterile, with cold metal tables and chairs not really livened up by the large, colourful umbrellas. 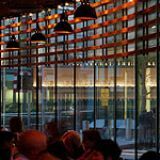 With the nearest London branch way out in the wilds of Zone 6, people in Canary Wharf will undoubtedly be eager to experience what Jamies Italian has to offer. 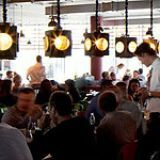 Considering its location and its owners’ celebrity chef status, you can expect the restaurant to be packed – queues in the other locations are incredibly common, especially considering the restaurant only takes bookings for large groups. 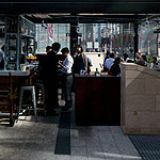 Expect the big crowds to arrive at lunchtime and during the evenings later on in the week, when those in the financial district are looking to take out clients or head out with colleagues to blow off steam. The majority of diners seem to be suited professionals but the occasional local pops up as well. Staff are a young and happy mix that are well informed about the menu if you ask, but not intrusive if you don’t. An upbeat ‘80s soundtrack livens things up a bit. The same menu with the same prices run across all the locations, with starters from about £3 to £6.50, pasta from about £6 to £11 (depending on size, as half portions are available as well) and most mains between £10 and £15. Choices include Italian classics (like spaghetti bolognese, antipasti and such) and Italian-inspired dishes, high on fresh ingredients and thankfully low on descriptive exclamation marks. There’s a lot of variety on offer, although a non-pasta vegetarian choice would be appreciated as well. Starters include antipasti planks (served on a plank of wood that’s balanced between tins of vegetables) priced at £6.50 per person for both meat and veggie options. Extra antipasti plates can accompany the planks or be ordered on their own as starters, including crispy squid with roasted red pepper mayonnaise (£4.95). Unfortunately some of the pieces are rubbery and hard to chew, but the batter is light, slightly salty and not too oily and the dish is complemented well by the tangy mayo dip. Mozzarella di bufala with basil pesto (£4.45) is a large portion of well textured chunks of mozzarella, but the flavour of the cheese itself is a bit bland and it’s overwhelmed by the nutty pesto, which has large grains of salt in it. Mains fare better, especially the Turbo Penne Arrabiata (£8.50 for a full portion, £5.75 for a half); the pasta itself is cooked perfectly al dente and the tomato sauce has a bold, spicy kick. Fine shavings of Parmesan sprinkled on top bring the flavours together. Jamie’s Flash Steak (£12.95) is described on the menu as being wafer-thin thanks to being pounded flat – apparently with sage and prosciutto. It’s as thin and as tender as promised but there’s an intensely smokey flavour that starts to overpower it about halfway through. The salsa on top though, made with yellow and red tomatoes, tastes vibrant and fresh. Sides of polenta chips and truffle chips (£2.95 each for a decent portion) are well cooked. The polenta chips are crisp on the outside and firm enough on the inside to make a welcome substitute for the classic potato version, whilst the truffle chips, cooked with truffle oil, are wonderfully aromatic and flavourful. Desserts run between £4 to £5 each and include an Amalfi orange tart, which is soft, delicately flavoured and appropriately crumbly, topped with a creamy scoop of mascarpone. The banana brownie is as rich, gooey and chocolate-y as you’d expect, but unfortunately the banana slices have been sprinkled on top rather than mixed through the batter, leaving them hard, chewy and dry after a spell in the oven. The vanilla ice cream served on the side though is good quality and a nice complement to the sweetness of the brownie. A short and to-the-point all Italian wine list is very reasonably priced, especially considering the area. Most wines are served by the glass, carafe and bottle, with prices from £14.50 a bottle and £3.95 a glass. Two organic wines include an unoaked Chardonnay di Puglia and a Sangiovese Terre di Chieti at £4.25 a glass and £14.95 a bottle. The Sangiovese is a light, sweet red with a hint of red berry flavours. Prosecco, sparkling wine and Champagne are also on offer, from £4.35 for a glass of Rosata Spumante Perla Rosa to £55 for a bottle of Billecart Salmon NV Brut Rose Champagne. Cocktails, including daily specials, are available at the bar and soft drinks (including the classically Italian limonata and aranciata citrus sodas) are also on offer. A big jug of tap water is offered almost as soon as you sit down. 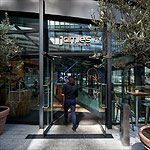 Most restaurants in Canary Wharf are chains and, with the opening of its fifth location, Jamies Italian is now firmly ensconced in that category as well. Although the food could use a little work this is something that will undoubtedly be ironed out with a bit more practice, and in the meantime, despite the sterile location, Jamies Italian succeeds in being one of the warmer, friendlier restaurants in the area.